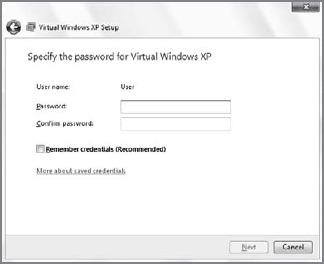 When you download and install Windows XP Mode and run it for the first time, you are prompted to provide a non-optional password for the default user account in Windows XP, which is imaginatively titled User (see Figure 18). Figure 18. You must create a password, but the Remember credentials option is even more important. The more important option is Remember credentials (recommended). We, too, recommend that you select this option, as the point of XP Mode is that you can seamlessly run XP applications side-by-side with Windows 7 apps. If you do not allow the system to remember your logon credentials (for example, your user name and password), you will be prompted to provide them every time you run an XP application. 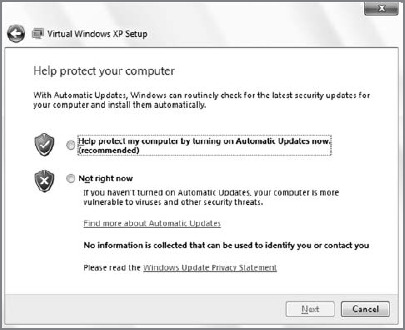 You're also prompted to configure Automatic Updates, as shown in Figure 19. Again, you should do so, as you want the underlying XP system to take care of itself. After initial configuration, you should be able to forget it even exists for the most part. Figure 19. Make sure you enable Automatic Updates. After this, you will have to wait quite a while as Windows Virtual PC steps through the process of starting the virtual machine, setting up Windows XP Mode for first use, starting the OS, and enabling integration features. What's happening behind the scenes is that Windows Virtual PC is actually moving through the post-Setup steps, creating the user and configuring the Automatic Updates setting you previously defined. When it's ready, the familiar Windows XP Desktop will appear in a window on top of your Windows 7 Desktop, as shown in Figure 20. Of course, running a virtual environment inside of a host OS like Windows 7 isn't the end goal here. The reason you're running Windows XP virtually in the first place is that you want access to that system's larger (and older) software library. From here on out, any application you install under Windows XP will actually appear in the Windows 7 Start menu, as shown in Figure 21. In this way, XP Mode is publishing installed applications to Windows 7. And when you run these apps from the Windows 7 Start menu, naturally, they run side-by-side with native Windows 7 applications, share the same clipboard and file system with the host environment, and so on. And really, that's the point: XP Mode isn't about running Windows XP. It's about getting incompatible applications to work properly again. Figure 20. Ah, the good ol' days. Figure 21. When you install applications in the virtual Windows XP environment, they also appear in the Windows 7 Start menu, so you can run them from there. It's not obvious, but this ability to run virtual applications inside of Windows 7 is not limited to Windows XP Mode. Nor is it limited to virtualized instances of Windows XP. You can do the same thing with virtualized Windows Vista and Windows 7 applications, too. Publishing applications is nice, but what about XP's built-in apps, like Internet Explorer 6? You can manually publish built-in Windows XP apps using the following workaround: launch Windows XP Mode, right-click the XP Start menu, and choose Open All Users. 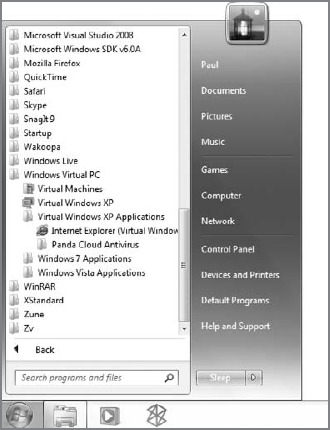 In the Explorer window that appears, navigate into the Programs folder. Now, drag a shortcut for the application you'd like to run into the Programs folder. Close it, close XP Mode, and check the Windows 7 Start menu: success! As it stands today, Windows Virtual PC is an interesting and, in many cases, desirable solution, especially with Windows XP Mode. But the underlying technology is still based on the legacy Virtual PC code and not on newer, hypervisor-based virtualization solutions like Hyper-V, part of the Windows Server 2008 product line. This technology runs closer to the metal than Windows Virtual PC, so it offers much better performance and is more secure and easily maintainable. Despite utilizing a different architecture, however, Hyper-V is compatible with the same VHDs used by Windows Virtual PC, ensuring that customers who adopted Microsoft's virtualization products early in the game could move their virtualized environments forward. Microsoft also offers more managed application virtualization products, which today are, of course, geared toward larger companies. Microsoft purchased a company called SoftGrid and relaunched its application virtualization solution as Microsoft Application Virtualization, or App-V. This software enables Microsoft customers to stream applications to the desktop in special virtualized packages. Instead of delivering an entire virtualized environment to end users, companies can deliver individual applications in a package, along with any required dependent files. These packages break the application/operating system lock and allow for some interesting scenarios, including the ability to run multiple versions of the same application on a single OS. Then, in 2007, Microsoft purchased another innovative company in the virtualization space, Kidaro. This acquisition gave Microsoft the final piece of the puzzle: the ability to combine the power of Virtual PC with the application independence of SoftGrid. The resulting product, Microsoft Enterprise Desktop Virtualization (MED-V), is basically a server-based version of XP Mode. Looking ahead, it seems like future versions of Windows will include a virtualization solution based on Hyper-V and some combination of the SoftGrid and Kidaro technologies. This would expand on the work done in Windows 7 but provide additional performance and manageability benefits. Then, in these future Windows versions, Microsoft will be able to move in completely new technical directions, secure in the knowledge that its virtualization platform will enable users to install virtually (sorry) any application that works on older versions of Windows. The key is packaging them into mini-virtualized environments that include only those parts of Windows XP, Windows 98, or whatever they need in order to run. Windows Virtual PC and Windows XP Mode are just one step down this road. They are an important step, of course.